In my other blog, I shared that I was forced to work under the intense heat of the sun in the past weeks because of a project assigned to me by my office. Because of this, I had to look for lotions and sun block that will protect me from the sun. Vaseline Skin Lightening Lotion is one of the products I used as my skin protector. Vaseline Skin Lightening Lotion has Vitamin B3 to help bring out natural fair skin, triple sunscreen to help prevent further darkening caused by sunlight, and yoghurt serum to moisturize skin. Vaseline claims that this lotion is clinically proven for radiant, naturally lighter skin as early as two weeks of continued application on the skin. When I bought this lotion, my intention is to use it as a sun block. However, this lotion is not intended as a sun block and is not good at protecting skin from the Ultraviolet rays of the sun. Thus, I do not recommend this lotion as a sun block. What I like about this lotion is that it eases the effect of sunburn. I had noticed that is smoothens my sun burnt skin after being applied with this lotion. 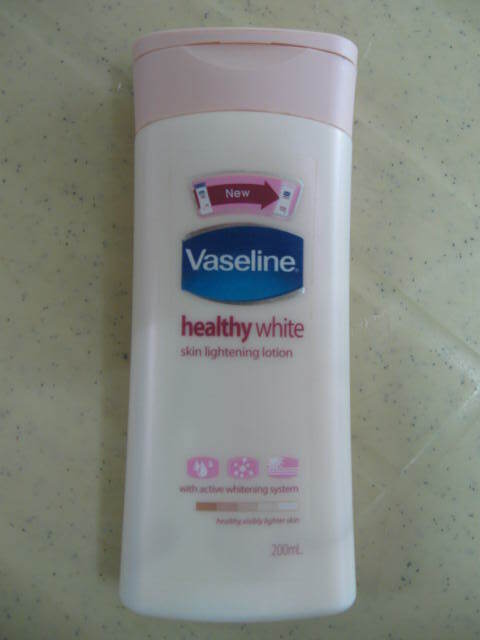 So for lightening skin darkened by the sun, you can use Vaseline Skin Lightening Lotion. However, I do believe that there are better whitening lotions in the market. I do not recommend this lotion as a sun block. Picture of Vaseline was copied from PinoyGoodies.